Orange K-9 Komfort 1.5 in. TufFlex D-End Collar . $17.95. Handsome collar for a big dog. My 90llb bulldog has a 22" neck and this collar fits and looks great! Love the material, seems very tough and well constructed. Shipping was fast and the collar was just what I ordered. Great fit. Love the color for the hunting season. I do not currently have a fence or a kennel, which means that my pup is on a lead during the day. That means that this collar is constantly getting a workout, and it is holding up nicely. 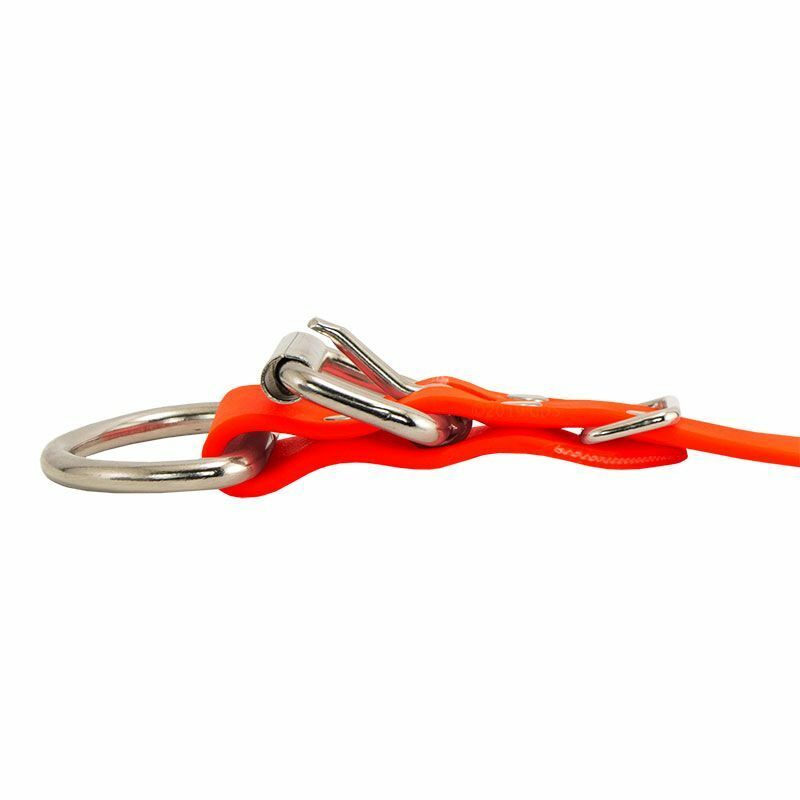 I like the large D ring for attaching leads. Great customer service. Personal phone calls to help get correct order. Will use again. Great collar! Easier to locate my dog when we are in the woods. Very easy to see in the woods and fits great. Will buy more. He stands out like a beacon with that bright orange collar. It is nice to have a collar that doesn't stink. It's durable too. I had to return the 1 1/2 inch for the 1 inch width as it was too heavy for my dog. The 1 inch width is perfect. It fits just right and cleans easily. He gets a lot of compliments on his sharp look. This the best hunting collar I have ever owned. 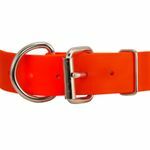 It is wide enough to provide an excellent view of hunter orange for the safety of your dog. I would like to see one that is 2 inches wide for next years hunting season! My dog is 85lbs and this collar is a great size for him. Bought this for the summer at the beach, nice soft material but doesn't absorb water. I like the added strength of the D-ring under the strap. This collar was a gift for my son's dog. I already have two that are on both of my boxers. Greatest collars ever can't be destroyed and hair does not stick to them,wash's out clean every time. I like the 1.5" inch width easy to spot in the fields on a fawn colored dog. "These collars are easy to keep clean and heavy duty." This is the second TufFlex collar I have purchased. I will not go back to leather! 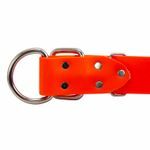 These collars are easy to keep clean and heavy duty. Looks great and easy to clean Chance loves it! "Easy to see, and soft." Easy to see, and soft. I would buy another. "Great collar. Easy to order, and extremely fast!" Great collar. Easy to order, and extremely fast! "Looks great and is easy to clean." Deutsch Drahthaar. Hunts. Family pet. Competes. Chief is one big dude. The 1.5" K-9 Komfort by TufFlex is awesome! Looks great and is easy to clean. No mess. No smell. Just reliable. "Collar is very nice and durable!" Collar is very nice and durable! The custom stamped plate was great too!!! "It was wide, and I like that because it allows me to hold dog." It was wide, and I like that because it allows me to hold dog. "Really like the extra wide collar." Really like the extra wide collar. It actually helps me get a better grip on my 5 month pup when I'm loading him in the truck kennel. "This is the best on the market!! LOVE it!" Just the perfect collar for my dog. We live on a mountain side and during hunting season, he really needs a sturdy orange collar. This is the best on the market!! LOVE it! Sturdy and well-made. A word of caution, however, the weight of the hardware is substantial. Too much for my 53 pound GSH when added with her GPS collar. (I cut the buckle out and sewed it permanently to size to slip over her head - works, but could have done cheaper!) Would probably be perfect for a 100 pound Lab. "Great collar that should last a very long time." Great collar that should last a very long time. Love this material and the rivited brass tags are great. I had to punch a smaller hole into the collar so it would fit my dog without having to order another to bridge the gap between this one and the puppy collar since she's still got some growing to do. Like the added visibility that you get with the 1-1/2 inch collar especially since her coat camouflages her really well in some terrain. "If you don't need a bell I highly reccomend this collar." My hunting dog is solid liver so the extra half inch of blaze orange really helped find her quicker in the ferns. The collar is heavy duty but the problem I have is I can't. Slide the swiss bell onto it because of the width and the D. Ring hung to low to attach it there. 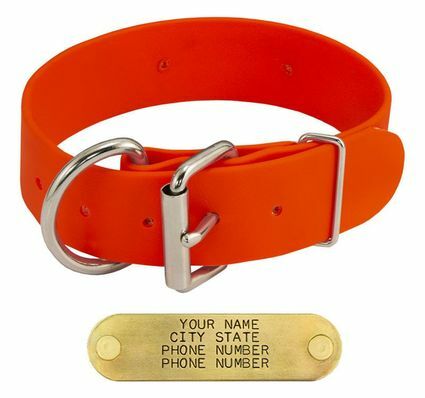 If you don't need a bell I highly reccomend this collar. This 1.5 collar was too big and bulky for my Brittany. If you have a large strong dog this would be a good choice, but for my dog it was too much collar. I did like the material it was made from. 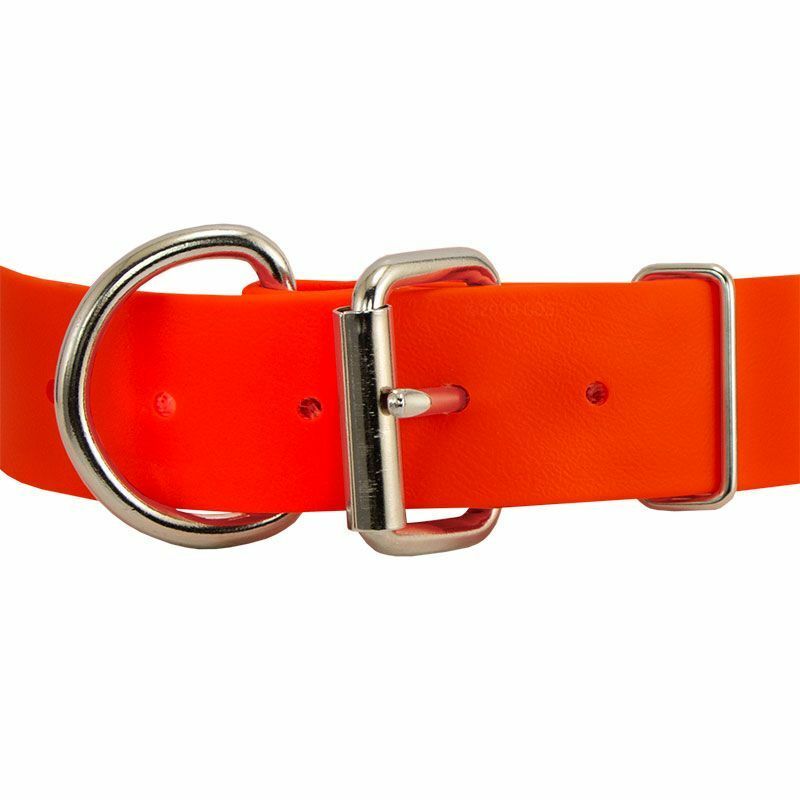 I reordered this in the 1 inch buckle collar for my dog. Way too small. The buckled collar inside measure was 2 inches smaller than represented. 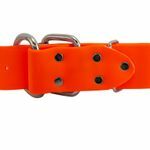 Dee-end collar is made from TufFlex, which is virtually indestructible and maintenance free. TufFlex cleans up with a damp sponge, resists mildew and bacteria and therefore is odor-resistant. This vinyl-coated webbing also keeps its flexibility in cold weather. Rivets are in line, not side by side, for increased durability. Welded hardware. 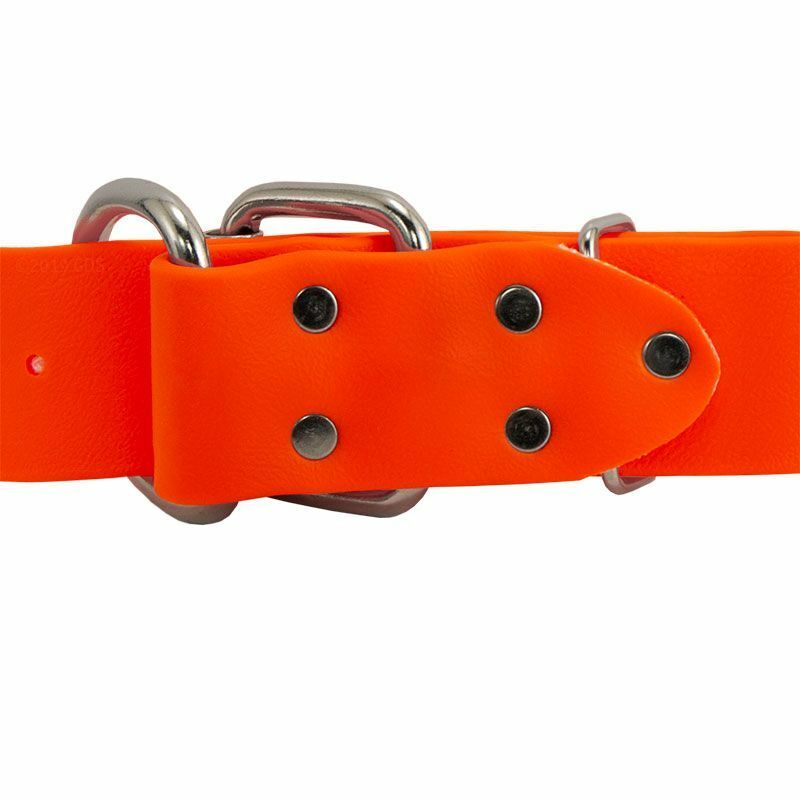 Rust resistant nickel-plated hardware consists of roller buckle, Dee and square keeper. All K-9 Komfort products are proudly made in the USA.